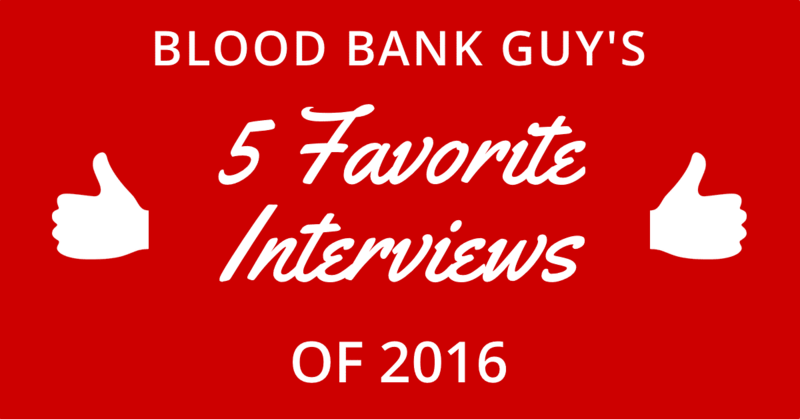 2016 marked a new beginning for the Blood Bank Guy website. Among other major changes, I debuted the “Blood Bank Guy Essentials Podcast” in April, an interview-style educational audio presentation targeted toward those learning blood banking and transfusion medicine. Since I couldn’t bring myself to create completely new stuff every other week, most of the episodes involved me interviewing an expert on a particular topic. I published 24 episodes of the podcast by the end of the year, and listeners like you downloaded those 24 episodes over 26,000 times! I had a great time doing every interview, and I recommend all 24 of them to you! Each of the incredible interviewees are amazing in their own way. However, I recently found myself reflecting on which ones I had enjoyed the most, for various reasons. Since 2016 is a few days from ending, and that calls for reflection and list-making, here are my five favorite BBGuy Essentials Interviews of 2016! I want to make it really clear that this list does not indicate a dislike for any of the other interviewees! Far from it! Many of those not on this list are close friends of mine, and I am honored and grateful for all of them. Please see the main podcast page to listen to any episode, as well as find the list of the five most downloaded episodes. The scoop: Kristine is an Assistant Professor at the University of Minnesota, but she has an international audience! Kristine runs the extremely popular site pathologystudent.com, a “go-to” resource for medical and dental pathology students worldwide. She has deservedly won numerous teaching awards from the students at Minnesota (she wins one pretty much every year, and has done so for quite some time now!). Direct link to show page for this interview. 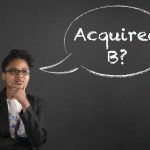 The scoop: My goal with the BBGuy Essentials Podcast is to help those who listen understand topics that are sometimes challenging or under-researched. The transfusion of plasma in situations where things have not been well-studied (such as before bedside or minor procedures when the coagulation tests show only mild abnormalities) is definitely one of those situations! Direct link to show page for this interview. Why it made my list: I feel so fortunate to have had the great (and I mean GREAT) Dr. Jeannie Callum from Toronto with me for this episode. Jeannie has done so much terrific writing and speaking on this issue, and she covers all the hot topics: Bedside procedures, warfarin correction, plasma use in liver failure and sepsis/DIC, and what role plasma plays in bleeding patients taking novel oral anticoagulants. She’s brilliant and quick and funny! The scoop: Dr. Mark Yazer works at the Institute for Transfusion Medicine in Pittsburgh, PA, and he was kind enough to join me as my first victim…er, interviewee on my new podcast! I heard Mark talk about the use of whole blood derived platelets at the AABB Annual Meeting in Anaheim, CA, in 2015. He was so comfortable, at ease, and hilarious that the session really stuck with me. When I decided to start my podcast, I reached out to Mark right away to be my first guest. Direct link to show page for this interview. Why it made my list: Because it was my first interview! Honestly, I didn’t have a clue what I was doing, and figuring out how to converse with someone while making sure I knew what question to ask next was almost overwhelming. However, Mark could not have been more gracious, and I loved talking to him (two big hockey fans talking about platelets; how great is that?!). Mark takes us through seven comparisons between whole blood-derived and apheresis-derived platelets, and his thoughts might surprise you! The scoop: Cassandra Josephson is a force of nature! Seriously, you will see her name all over the pediatric transfusion literature, and she has been and continues to be involved in many of the important studies in that field. I admit that pediatric transfusion is not an area of focus for me, but I couldn’t think of anyone I would rather learn it from than Cassandra, so I asked her to chat with me about a variety of topics. Direct link to show page for this interview. Why it made my list: Cassandra is passionate, funny, and incredibly knowledgable, and that comes through loud and clear in this episode! I’m certain that this episode sets the record for most words spoken (as both she and I have a tendency to talkreallyreallyfast when we get excited), but you’ll hear great info on things like pediatric platelet transfusion, CMV, sickle cell disease, and HDFN. The scoop: It just dawned on me while writing this that three out my five favorite BBGuy Essentials episodes involve interviews with Canadians! 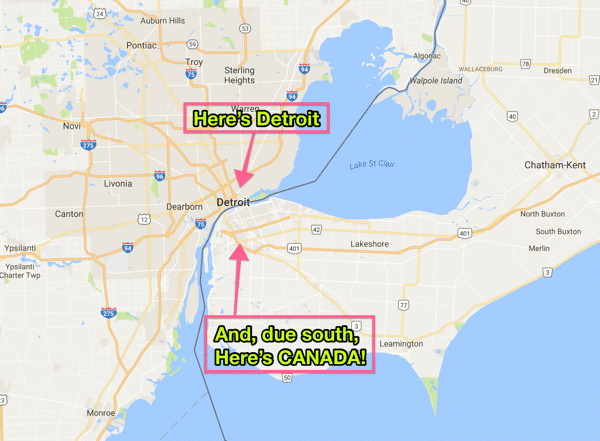 Well, since I was born and raised in the only major U.S. city where you can go due south and get to Canada (Geography quiz! Do you know it? The answer is below…), I suppose that is reasonable! Nancy Heddle, Professor Emeritus at McMaster University in Hamilton, Ontario, is truly a master teacher and researcher! I reached out to her when the landmark “INFORM” study debunking most of the controversy regarding potential adverse effects of “old” RBCs was published in the New England Journal of Medicine late in 2016, and to my surprise, she was excited to participate! Direct link to show page for this interview. Why it made my list: This is my favorite episode of the year primarily because Nancy is simply wonderful to interview! She is so smart, so kind, and so interesting that the interview just flew by for me (I can’t speak for her; it may have been like a visit to the dentist on her side!). She patiently laid out the case for the INFORM study and why it appears that the age of blood at the time of transfusion doesn’t really matter, and shared useful and practical information throughout. I think that you will love this one! ANSWER TO GEOGRAPHY QUESTION ABOVE: I am from fabulous Detroit, Michigan! Don’t believe me about the “going due south into Canada” thing? See the image below, straight from Google Maps! I hope you’ve enjoyed the podcast this year, and my five favorite episodes (plus two)! I’m looking forward to more great topics and discussions in 2017, and I can’t wait to share them with you. Just wanted to say thank you. I recently passed the higher specialist diploma in transfusion science in the UK and found your pod casts and quizzes very helpful. They made my training programme much more interesting and kept me focused during those dark study days. I’m honored to help you, Alison! Congratulations! PLEASE ADD ME TO THE EMAIL LIST. THANKS. Erica, I’m very glad you are interested in the e-mail list, but you have to do that yourself at my sign-up page. This is a good thing, because it makes sure that you are really you and that you really want to be on the list. Thanks for your interest!